Our mission is to educate, serve, and offer enrichment to the Rollins, Central Florida and global communities. Our music students understand what poet Henry Wadsworth Longfellow meant when he said that "Music is the universal language of mankind." Your training in the performance (applied music) area will sharpen your awareness of languages and cultural context and aid you in communicating your inner thoughts and developing an intellectual understanding of the world. You will have access to performances and master classes of outstanding merit by resident and guest artists from around the world. You will become a global ambassador during international experiences and concert tours, connecting with local and global communities through performance, education and service. You will also have the opportunity to study abroad in Spain, Italy, China, England, Ireland, and Germany where you can use your time to improve their language skills and take part in many cultural events involving the performance of music. You will have performance experience through choral and instrumental ensembles, and individual training in applied music. You will not only have a world class education in performance, but also in historical literature, and theory – the background necessary for a productive career, whether through graduate work or an immediate career in music. In music ensembles you will exercise responsible leadership skills in a group setting. You will also be encouraged to take conducting as part of your musical education, courses that will allow you to further develop and practice these leadership skills. 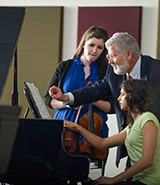 A jury will assess your skills and competencies in applied music studies at the end of every semester. 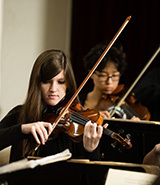 The process allows the Department to evaluate your progress in performance, technical ability and understanding of the repertoire, as well as organization and teamwork skills, working collaboratively with accompanists. Past results demonstrate you will make connections and be on your way to becoming an independent thinker, taking responsibilities for your own work and striving to improve as a responsible leader. You will participate in music-related community events throughout the academic year, including performances in churches, retirement centers, nursing homes, and schools (domestic and international), enabling you to perform and interact with audiences of different social backgrounds. 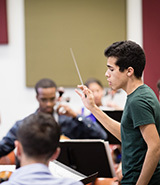 You will be prepared to actively participate in your community through music and, thus, your training within the vibrant liberal arts setting at Rollins will lead to a meaningful and productive life.